A yoga practioner's journey from Mysore in south India to Ladakh in the Himalayas, seeking a spiritually authentic way of experiencing the country. India: colourful, chaotic, historical and multi-layered. 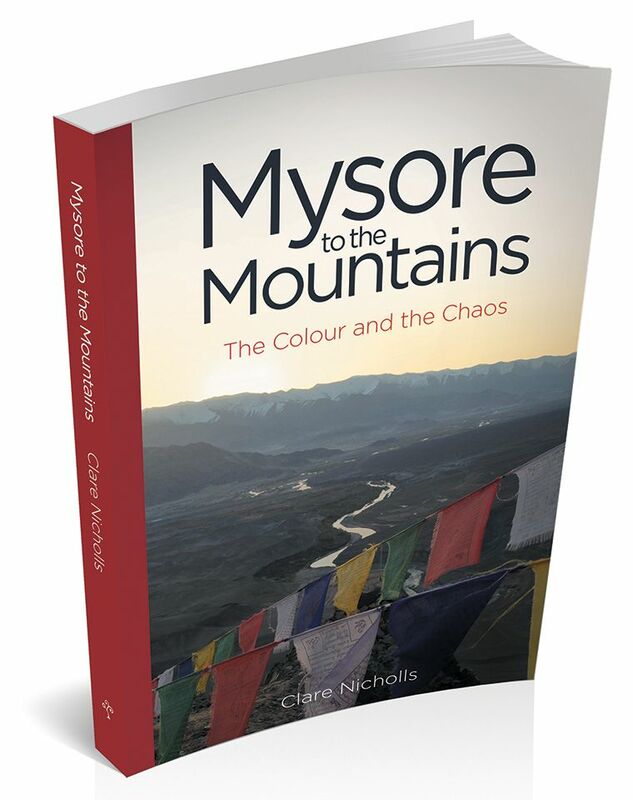 With an acute eye, affection, humility and curiosity, Clare’s journey around India from Mysore in the south to Ladakh in the Himalayas is described in a way that interweaves the myths, values, beliefs and landscape of this extraordinary country. As a solo woman traveller, Clare’s adventures range from learning yoga in an organised shala to practising on her own in ancient temples; using local buses to negotiating with rickshaw drivers; exploring cities to the secret caves of Ellora and the temples of Hampi; and beach time in Goa to volunteering at the Students Educational and Cultural Movement of Ladakh. This engaging first book shows the reader many of the facets of India, and how a woman alone can experience the cultural, spiritual and everyday life of India today. Also available on Nook, Kobo and Kindle. Clare’s love of Indian mythology and philosophy began at the age of six, when she watched the Peter Brook Company production of The Mahabarata. Since then Clare has known that the act of sharing experiences, musings and telling of tall tales is innately human. In her early twenties she discovered the physical practice of yoga and began her studies of Indian philosophical systems. Initially studying in Dorset with Wendy Haring, Clare completed her teacher training with the British Wheel of Yoga in 2007. After a move to London Clare discovered Jivamukti Yoga and following study with Sharon Gannon and David Life gained the Advanced Teacher Certification in 2017. She now teaches Jivamukti Yoga and the philosophy of yoga worldwide. Writing about her experiences has become Clare’s opportunity to reach a wider audience and encourage solo women travellers. When not writing, teaching or travelling she works as a midwife in London.